Click here or on the image below to read in full. Poor weather-related driving conditions are associated with 7,000 fatalities, 800,00 injuries, and more than 1.5 million vehicular crashes annually in the United States. Adverse weather is present in 28% of total crashes and nearly 20% of highway fatalities. Familiarize yourself with upcoming travel routes. Don’t be indecisive, be prepared. Watch for spots that inhibit ice, including: shaded areas, bridges, overpasses and exit ramps. Reduce your speed and be prepared to stop at intersections, even if you have the right of way. Watch for black ice. If the vehicle in front of you has no spray from its wheels, you’re likely on ice. Conduct a thorough pre and post trip inspection as it is crucial that all key systems are functioning.  Chains– Make sure you have enough and in the correct size! SLIPS, TRIPS, AND FALLS ARE THE MOST COMMON INJURY IN OUR INDUSTRY. 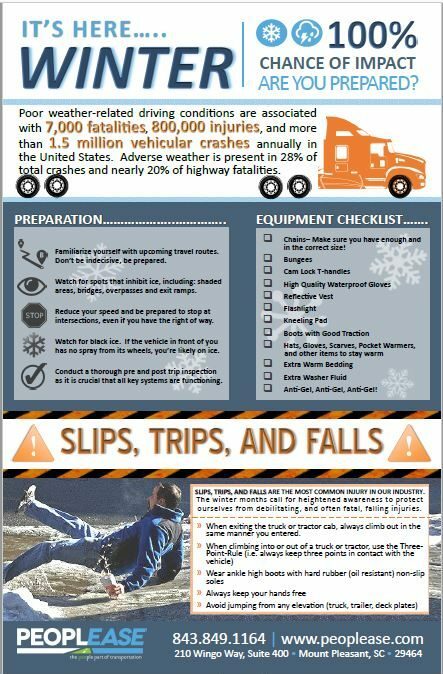 The winter months call for heightened awareness to protect ourselves from debilitating, and often fatal, falling injuries. » When exiting the truck or tractor cab, always climb out in the same manner you entered.